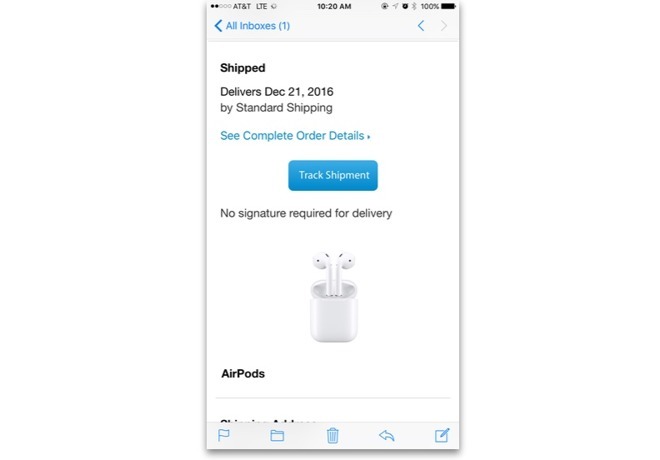 Customers lucky enough to have snagged a pair of Apple AirPods when product sales went live last week recently received word that their orders have shipped, and are scheduled to arrive as promised on Dec 21. As seen above, early bird buyers who placed orders within the first two hours of AirPods availability began to receive shipping confirmations by email Saturday morning. AirPods, Apple's first branded wireless headphone product, went up for sale on Dec. 13 after a month of delays. A hotly anticipated item, initial supply was quickly depleted, pushing back shipment estimates to four weeks mere hours after release. Apple's webpage shows current delivery dates moved into February. Alongside preorder shipments, AirPods are rumored to land in brick-and-mortar Apple retail stores, as well as mobile carrier outlets and Authorized Apple Resellers, as soon as Monday. Exact store allotments are unknown, but judging by preorder demand, supplies will be extremely constrained. Prior to last week's surprise release, some speculated Apple would miss the lucrative holiday shopping season due to unforeseen production issues related to audio syncing. AppleInsider's own sources corroborated reports of engineering problems, but said AirPods was on track to ship before year's end. Earlier this week, AppleInsider took an early look at a production model and came away impressed with the hardware. Flawless syncing between each earbud, combined with deep software integration and touch controls, makes for an immersive experience not found with competing products. For those who didn't make the preorder window, AppleInsider is giving away a pair of AirPods to one lucky winner. To enter, subscribe to our YouTube channel and leave a comment in our AirPods giveaway video or follow us on Instagram. The entry period ends at 11:59 p.m. Eastern on Dec. 21, and the winner will be announced in a video posted to our YouTube channel on Dec. 22.